Finn Russell set tentative sights on the Six Nations title after delivering a man-of-the-match performance in Scotland's stunning 25-13 victory over England at Murrayfield on Saturday. 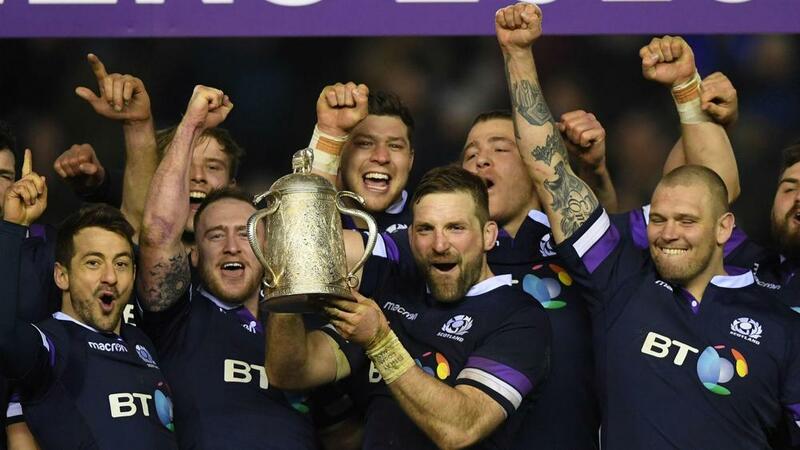 Russell's early tournament struggles intertwined with Scotland failing to live up to their hype as potential dark horses, but Gregor Townsend's side finally delivered the kind of thrilling rugby that had been anticipated in this Calcutta Cup clash. The famous old trophy is Scotland's for the first time in 10 years after Huw Jones' double was added to by Sean Maitland's score during a blistering first half, in which Russell was central to the hosts. Russell was taken off in the victory over France two weeks previously after delivering an error-strewn performance, making this supreme display all the sweeter. "It's amazing, just listen to the crowd. But it's unreal for us, it's been 10 years since we won it, so it's great to be a part of it," he told BBC Sport. "It's been a tough couple of weeks for me, but I'll keep smiling no matter what anyone says. I've enjoyed all three weeks, especially this one. We might not have had the best few games, but we managed to turn it on today. "I don't know if we surprised ourselves, but we had a game plan today and we executed it really well. Look at the autumn internationals. We played outstanding in those three games so we managed to get back on that kind of form and it's awesome. "It's definitely going to be tough for the last couple of games but if we keep performances up like that we've got a chance." Captain John Barclay said Scotland were motivated by the doubters, and hailed Russell as one of the best players in his position in the world. "We were fuelled by last year [a 61-21 Twickenham thrashing], fuelled by the disappointment of the Wales game [a 34-7 reverse at the start of this year's competition]. "As we said after the Wales game, we haven't become a bad team overnight. It was great to get a win against France and that's another great win, so that blows the competition open a bit now." On Russell, Barclay added: "I predicted he'd be man of the match today. That's the nature of the guy, it's his character. He plays on that line, he probably didn't have his best games in the first two games but today he was outstanding. He's one of the best stand-offs in the world, I believe."